The Cache la Poudre River National Heritage Area (CALA) is announcing its 2017 Heritage Culturalist Program (HCP) training dates with a call for interested individuals to apply. This project is paid for in part by a History Colorado – State Historical Fund Grant. * HCP training is scheduled for April 20-22, 2017, and applications are currently being accepted via the website: https://poudreheritage.org/heritage-culturalist-volunteers . 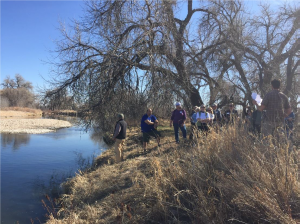 Community members in Larimer and Weld counties with a passion for learning and sharing the history of the Poudre River are encouraged to apply. 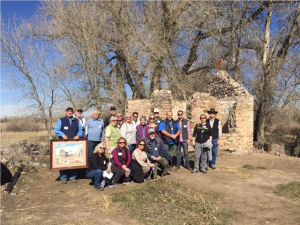 The training features classroom sessions at the Poudre Learning Center and field learning expeditions led by local historians, authors, and experts in the field of history and historic preservation. Space is limited. For more information about the Heritage Culturalist Program and to obtain a volunteer job description, please go online or contact the Poudre Heritage Alliance Program Manager Maggie Dennis at 970-295-4851 or programs@poudreheritage.org. The award of the History Colorado State Historical Fund grant will allow the Cache la Poudre River National Heritage Area and its non-profit managing entity, the Poudre Heritage Alliance (PHA), to offer the HCP training program in 2017 and 2018. The overarching goal is to produce a dedicated group of certified volunteers and to continue to document and celebrate historic buildings, landscapes, and engineering structures in the CALA for years to come. The grant award gives the Poudre Heritage Alliance the ability to recruit outstanding presenters for the training, market the program in the CALA’s communities, and enhance resources available to volunteers. National Heritage Areas (NHAs) are places where natural, cultural, historic, and scenic resources combine to form a cohesive, nationally distinctive landscape arising from patterns of human activity shaped by geography. The Cache la Poudre River National Heritage Area (CALA) is one of 49 NHAs and encompasses the “working Cache” – 45 miles of the Poudre River, beginning at the eastern edge of Roosevelt National Forest boundary and continuing to its confluence with the South Platte River east of Greeley. This region was designated by Congress to provide for the interpretation and promotion of the area’s unique & significant historical contributions to our nation’s heritage of water law, western cultural & historical lands, waterways, and structures. For more information about the PHA or CALA, please contact the Poudre Heritage Alliance Office at admin@poudreheritage.org or 970-295-4851. *The contents and opinions contained herein do not necessarily reflect the views or policies of History Colorado. WASHINGTON (February 2, 2017) – Cache La Poudre River National Heritage Area is one of 21 national parks selected to receive a 2017 Active Trails grant from the National Park Foundation, the official charity of America’s national parks. Now entering its ninth successful year, the multi-faceted Active Trails program enriches national parks; strengthens relationships between parks, community members and organizations; and supports individual growth and well-being. Since 2008, the National Park Foundation has granted nearly $3.8 million through its Active Trails program. As of early 2016, Active Trails has engaged more than 15,000 volunteers and nearly 900 project partners. “National parks offer great spaces to recreate, be active, and build community. Whether it is admiring a dark night sky, walking in the footsteps of your ancestors, or taking part in a healthy exercise challenge, our Active Trails grants make it possible for people from all backgrounds to engage in activities that are good for the body and mind,” said Susan Newton, senior vice president of grants & programs at the National Park Foundation. The entire list of the 2017 Active Trails recipients can be found here. The Active Trails projects are great examples of the countless ways there are to #FindYourPark. Launched in March 2015, Find Your Park/Encuentra Tu Parque is a public awareness and education movement to inspire people from all backgrounds to connect with, celebrate, and support America’s national parks and community-based programs. #FindYourPark invites people to discover and share their own unique connections to our nation’s natural landscapes, vibrant culture, and rich history. The National Park Foundation wishes to thank The Coca-Cola Company and The Coca-Cola Foundation for their generous support of the Active Trails program. More than 25,000 National Park Service employees care for America’s 414 national parks and work with communities across the nation to help preserve local history and create close-to-home recreational opportunities. Visit us at www.nps.gov, on Facebook www.facebook.com/nationalparkservice, Twitter www.twitter.com/natlparkservice, and YouTube www.youtube.com/nationalparkservice.